A cappella setting of the Latin text, open scored for SATB with lots of independent movement in the voices. A suitable challenge for contest or festival use. The ACDA Choral Journal wrote, "Its lush chords and well-constructed vocal lines will be a welcome addition to the repertoire of any well-trained choir." Strong, robust setting for men's voices of the Latin "Benedictus," taken from the "Sanctus" section of the Roman mass. Translated, it means "Blessed is He who comes in the name of the Lord." Suitable for church or school; contest or festival use. Add some "island flair" to your holiday concert with this delightful Venezuelan carol tune set in a light calypso style. Limited vocal ranges, repetitive motives, and the included bell parts make this Ruthie original a no-brainer for developing choirs easing into part-singing. Delightful piece incorporating "We Wish You a Merry Christmas" and "Deck the Halls" (melody) which teaches students the phrase "Merry Christmas" in several languages, and also encourages acceptance of other cultures by focusing on the feelings we all share at Christmastime, no matter where we call home. Text and music by Gene Grier and Ruth Elaine Schram. Thoughtful story song for young voices by Gene Grier and Ruth Elaine Schram incorporates the traditional German carol "O Tannenbaum." Teaching opportunities include changing meters and modes, yet the song is moderately easy to learn with very supportive accompaniment . Inspiring message of multi-cultural acceptance by Linda Marcus and Ruth Elaine Schram. "...All the world is painted with colors of love..." Text focuses on our similarities rather than our differences, and yet points out that there is beauty in all the variations. Cute Hanukkah partner song for young voices, perfect for winter concerts. Incorporates the traditional Jewish folk song "My Dreidle" with original words and music by Ruth Elaine Schram. Easy to learn in conventional partner style for Two Part voices; may also be performed as a unison piece throughout. Delightful collection of twenty songs for celebrations throughout the year. 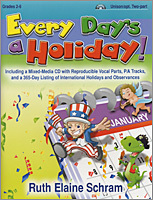 Includes a fabulous chronological listing of national and international observances for all 365 days of the year! Suitable for Grades 2 - 6. Fun, educational piece that includes greetings of friendship in English, Spanish, French, Italian, and Chinese, with optional sign language. Pictures to demonstrate the American Sign Language phrases are included in the score for ease of learning, and cues are given throughout the score for placement of signs. This setting of one of the many Irish Blessings is beautifully set with a gentle melody and colorful, yet supportive, harmonies in the keyboard. Very expressive, this piece may be performed unison, as a solo, or as a Two Part work. Suitable any time during the school year, it is especially meaningful as an end-of-year piece or for graduation services. A haunting keyboard introduction recurs as a unifying device and beautifully complements the mesmerizing melody throughout this tender original selection by Ruth Elaine Schram, utilizing two familiar Irish blessings. Well suited for church and school use throughout the year, it will also serve as a wonderful benediction or concert closer. 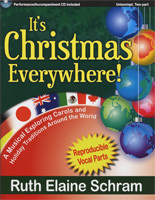 This multicultural delight is an around-the-world celebration of Christmas, exploring carols and traditions from Germany, Japan, Australia, Africa, Mexico, Canada, and Spain. A marvelous budget-stretcher, this book includes vocal/piano scores, reproducible vocal parts, narrations, and a Performance/Accompaniment CD. Approximately 25-30 minutes in length, it is equally suitable for school or church use. This easy to learn Hanukkah piece by Linda Marcus and Ruth Elaine Schram for Three Part Any Combination voices begins unison, then develops into a three part round. The third part may be taken down an octave for a Mixed Ensemble or sung as written for Treble Voices. The lyrics consist of an authentic Hebrew phrase and English translation, giving you the opportunity to teach your students about Hanukkah and its meaning to the families who celebrate it, while the music has a truly ethnic feel. Your students will have a memorable moment in their winter concert with this lively seasonal work. One for sorrow, two for joy; three for a girl and four for a boy. Five for silver, six for gold; seven for a secret never to be told ... This old British poem is the theme of this clever original from Ruth Elaine Schram. Reminiscent of a folk song, it is set in a minor key to give the music a mock seriousness, while the whimsical text is a delightful contrast. Very easily learned, with lots of unison, easy echo singing, and some part singing. This fresh setting of the "Old Irish Blessing" is gentle and positive, yet can be sung with firm unanimity. The message of hope and encouragement, and wish for a safe return, is appropriate for use throughout the year. It would make a very meaningful benediction, or end to a Spring concert or Graduation ceremony. This appropriately mournful setting of the traditional Latin text is rich in harmonic nuances and lyrical melodic lines. With full Latin text, singable voice parts in open score, and a keyboard part that does more than support the voices, this is a work of high quality for mixed choirs. May also be done a cappella by more advanced choirs for an additional challenge. In this beautiful choral lullaby for treble choirs, Debussy's gorgeous "Reverie" is artfully woven with the Welsh "All Through the Night." Your treble choir will grow musically while learning this dreamy selection. "Sleep, dear baby, sleep all through the night..." Suitable for school or church use. This beautiful anthem is based on the well-known German Christmas carol "Stille Nacht," but set in 4/4 rather than the traditional 3/4, giving the melody a more relaxed feel. An original second melody and lyrics works alone or as a lower descant or counter-melody. The lush keyboard part may also be used as a piano solo during the holidays. Warm, lyrical setting by Ruth Elaine Schram of the text by renowned Scottish poet Robert Burns. Perfectly suited for ladies' voices, with lots of opportunities for expressiveness and a wonderful aesthetic musical experience for your students. Suitable any time of year, particularly for Spring concerts. This beautiful Czech carol is a tender song of adoration to the Christ child. Arrangement is available with an optional flute part (or other C-instrument), and is suitable for school or church use. 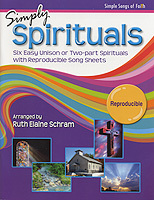 This is an easy partner song by Linda Marcus and Ruth Elaine Schram, based on a Hebrew phrase with a very positive message for your singers. The words and melody are easy to remember and work as a canon, providing opportunities to teach about rounds and repeats. In this collection of twelve beloved carols, Ruth Elaine Schram has arranged six unison or two-part songs that celebrate the musical traditions of France, England, Ireland, Wales, Germany, and the United States. It boasts supportive piano accompaniments, reproducible song sheets, and an optional fully orchestrated recording (orchestrated by Tim Hayden). As an added bonus, reproducible narrations that give historical detail may be added to introduce each carol and create a special program. "Simply Carols" is an outstanding resource for children's and youth choirs, as well as small adult and senior choirs. Suitable for school or church. Ruth Elaine Schram and Linda Marcus have once again combined their considerable talents to create this marvelous musical gem for Hanukkah. Set in minor mode with strong melodic lines, effective dynamic contrasts, and an uplifting text, this celebratory selection will be the perfect addition to any holiday program. Available in two voicings. Christmas lullaby for ladies' voices based on an unexpected pairing of the beautiful Traditional Welsh carol, "All Through the Night," and the gorgeous Traditional English "Coventry Carol," combined with original material by Ruth Elaine Schram. This exquisite collection of vocal solos features folk songs from China, Japan, Korea, Malaysia, Taiwan, and Thailand. Appropriate for both developing singers and mature vocalists, each of the ten beautiful arrangements is sung largely in English, and a phonetic pronunciation guide is included for the phrases in Asian languages. Perfect for Recitals, Concerts, and Contests, with arrangements by Ruth Elaine Schram, Vicki Tucker Courtney, Ruth Morris Gray, Marti Lunn Lantz, Sonja Poorman, and others. Professionally recorded Piano Tracks are available either in the Book/CD Combination or the separately available Accompaniment CD. Easy to learn but effective arrangement of the familiar German carol, now available for SATB as well as Three Part Mixed or Two Part voices. Suitable for school or church use. The gorgeous lullaby that has been heard in several commercials has been arranged for young voices, and will be a lovely addition to your holiday concert or festival repertoire. Available in Three Part Mixed and Two Part voicings, the original language is provided as well as the English translation. Suitable for school or church use. Now available in the new "Children of the World" book from Alfred. "Together, We Can Change the World" (Songs for a Better Planet) is breaking new ground - all of the scores and resources are provided as data files on the CDrom, making this collection 100% reproducible. In addition, the folder in which the CD is encased is printed on 100% post-consumer recycled material. Whether you need unison choral pieces, a resource to introduce your students to part-singing, or a full-scale musical complete with narrations and supporting materials, these enriching songs fit the bill. The optional use of partner songs and simple two-part harmony subtly underscores the themes of cooperation and community building that run throughout this collection. Beginning with songs that encourage friendship and acceptance, the collection progresses to songs that introduce "green" themes of reducing waste, recycling, and working together to cherish and protect our natural resources. Narrations are included to give additional information and introduce each song, and delightfully orchestrated Accompaniment tracks (by Tim Hayden) are included. Powerful setting of the Latin text which means "where there is charity and love, God is there." Although there are some unexpected chord progressions, this song is only moderately difficult. Available in three voicings. May be used in church settings; also suitable for school contest and festival use. A powerful multicultural message, in any language!